Wildlife experts fear that the adder may be extinct in Nottinghamshire after another annual survey failed to find any evidence of the reptile. 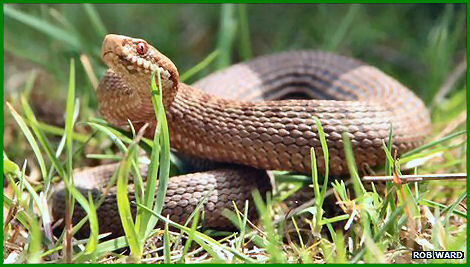 The last confirmed sighting of the venomous snake in the county was in Sherwood Forest in 2005. Nick Crouch, a conservationist, said its disappearance was "very worrying" as the species was a key indicator of the health of the food chain. The wildlife expect has appealed for the public to report any sightings. Mr Crouch, a nature conservation leader for Nottinghamshire County Council, said the species was once quite widespread across Sherwood. Adders are in rapid decline in the UK and experts put this mainly down to habitat loss and disturbance. "These snakes require areas of heathland and woodland," Mr Crouch said. "These areas are being lost or are not being managed properly but quite why the adder seems to have disappeared in Nottinghamshire is a bit of a mystery. "There's still plenty of suitable habitat left in the county including where the snake was recorded in 2005." Nottinghamshire County Council is encouraging people to report all sightings of reptiles in the county, including grass snake, slow worm and common lizard. "Such information helps us to identify important areas for these species, and to target action to conserve them," Mr Crouch said. All sightings should be reported to the Nottinghamshire Biological and Geological Records Centre at Wollaton Hall. Adders could soon be hiss-tory in the UK, according to new research. A nationwide survey by the Amphibian and Reptile Conservation (ARC) Trust found adders have been vanishing from our countryside since 2007. Adders are the UK's only poisonous snake, but now researchers say they might need conservation. It's thought lots of adders are killed because they're poisonous, but the ARC Trust says their decline may also be caused by disturbance of their habitat. What snakes are there in the UK? Adders aren't the only reptiles in trouble though. The study found slow worms, common lizards, grass snakes, common toads and common frogs are also becoming less widespread. The only species among reptiles and amphibians that was found to be increasing its range is the palmate newt.